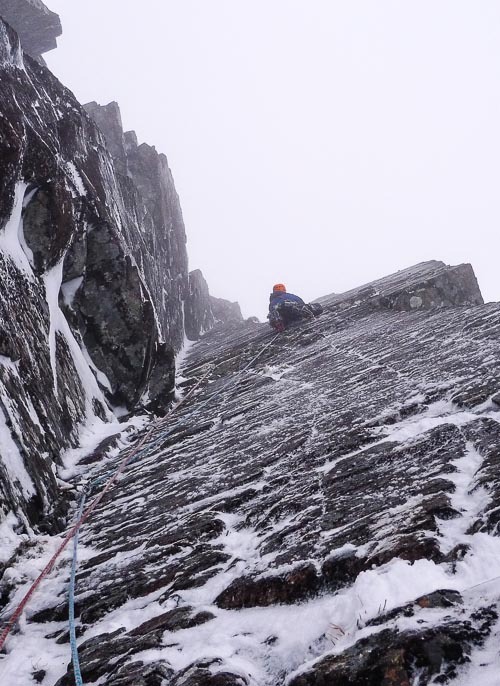 Iain Small and Uisdean Hawthorn pulled off the ascent of the season so far on December 14 with the first winter ascent of Shadhavar (VIII,9) on Stob Coire nan Lochan in Glen Coe. “After missing the good weather at the weekend I was able to get out on the Monday with Uisdean for a rather belated first route of the season,” Iain told me. “There had been a considerable dump of new snow overnight so it was a wade into SCNL with rain to start the walk-in with. Not my preferred start to the day or the season! Anyway, we had some weird snow conditions with a fair amount of debris from the gullies and a slide out of Twisting Gully just before we crossed over. I fancied something technical but safe to kick start the winter, so Ian Taylor and Tess Fryer’s new line from the glorious summer of 2013 was in my mind. Taking the smooth right wall of the Unicorn main corner, it takes a laser-thin crack that Ian mischievously commented on as ‘perfect pick width’. This entry was posted in New Routes and tagged Iain Small, Stob Coire nan Lochan, Uisdean Hawthorn. Bookmark the permalink. Was looking across to this from Tilt last season and marveling at the quality of the line. It’s a stunner!